fabric8 was pleased to present Inside Outside, a two-man show by Daniel James Burt and Romanowski, in collaboration with Flora Grubb Gardens, featuring indoor and outdoor works of art in their brand-new Sculpture Garden. 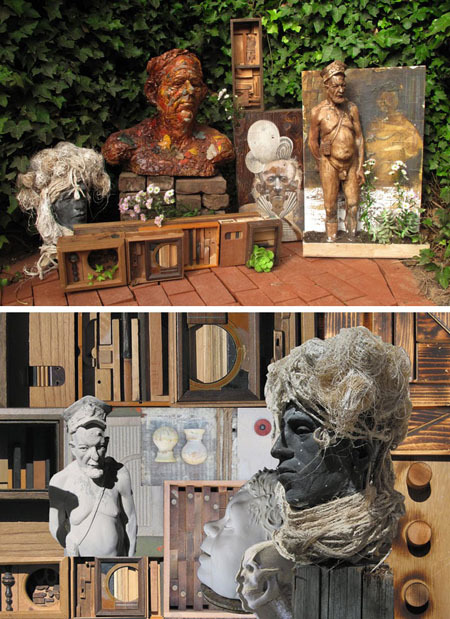 Exploring the concept of “inside” beauty being brought outside, and vice versa, this collection of sculpture and assemblage features work that is both organic and man-made. Plant life inhabits art in living, growing pieces throughout the existing gallery, while artwork makes it way outdoors into fabric8’s recently-expanded garden. fabric8’s largest show-to-date, Inside Outside furthered the concepts of art and design as well as form and function. Daniel James Burt is a San Francisco-based sculptor whose intuitive style integrates mixed media to create installations and stand-alone sculptures. His use of body parts to create a series of landscapes as a means of portraiture garnered a commission that rests alongside a Ruth Asawa sculpture. He has a BFA from the University of New Mexico as well as an MFA from Academy of Art University, where he currently teaches graduate level Figure Modeling and Anatomy. Romanowski is a Swiss-born artist, musician, and DJ who has made San Francisco his home since 1988. His keen sense of style and extraordinary talent for vintage shopping has made him one of the most sought-after DJs and collectibles hustlers this side of Zurich. His artwork includes top-notch spray stencil pieces and found object assemblages that are coveted by music and design aficionados around the world. Inside Outside was on exhibit from July 2 through August 2, 2010.